When we start listening exclusively to ourselves, it’s our feelings that are usually doing the talking. Emotions can be so strong and speak with such authority that it can take a great deal of effort to hear anything or anyone else. There are a number of reasons why we’re prone to get off track when we start listening to ourselves instead of speaking the truth to our hearts. 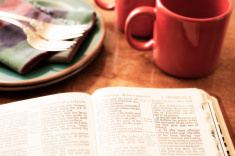 The following cautions remind us why we must not depart from God’s Word-even for a moment. 1. Apart from God’s Word we cannot think God’s thoughts. There are examples all throughout Scripture that describe God’s people sliding into sin when they stopped trusting and obeying His Word and started listening to the world and their own thinking. Psalm 42 is an example of how overwhelming circumstances can make us vulnerable to taking our eyes off God and losing our spiritual equilibrium. The only way the psalmist found his way through his own time of testing was by remembering who God is, what He has done, and what He’s promised to do for all who look to Him. Why are you cast down, O my soul, and why are you in turmoil within me? Hope in God; for I shall again praise HIm, my salvation and my God” (42:5). The Word of God alone provides truth that leads to life, holiness, and everlasting joy. We must abide in God’s Word moment by moment or we will be deceived. 2. Our flesh makes a poor master. By nature we crave comfort, security, affirmation, non-stressful circumstances, and happiness. We do all we can to avoid pain and suffering. When our flesh starts talking, it often sounds very reasonable and right to us, yet can be dead wrong. James tells us where it will eventually lead if we listen to and obey our flesh. But each person is tempted when he is lured and enticed by his own desire. Then desire, when it has conceived, gives birth to sin and sin, when it is fully grown brings forth death, James 1:14-15. Praise God, Christ rescued us from being slaves to sin to becoming slaves of righteousness! We have a different master, Jesus Christ, who bore our sins on the cross, that we might be free from their enslaving power. Paul says, …Thanks be to God, that you who were once slaves of sin have become obedient from the heart to the standard of teaching to which you were committed and, having been set from from sin, have become slaves of righteousness, Romans 6:17-18. 3. The world’s messages communicate what our flesh wants to hear. It’s not only easy to find agreement with the things our self-absorbed flesh wants to hear but, even when we’re not feeling discontent or unhappy, the world is bent on enticing us with things that will lead us away from the path of holiness. The apostle Paul says we must deal ruthlessly with these self focused desires; Put to death therefore what is earthly in you; sexual immorality, impurity, passion, evil desire, and covetousness, which is idolatry, Colossians 3:5. 4. We have an enemy who knows where we’re vulnerable. Satan knows exactly when our defenses are down and where we’re most prone to believe lies. If our desire is the approval of others, he uses that to his advantage. When we are feeling alone, he knows just where to aim his dart. If we struggle with guilt over past choices, he’s the first one to accuse us of being impostors in God’s family. But his favorite tactic is to take advantage of those who feel confident of their own abilities and strengths and don’t believe they could ever fall. This means we must watch and prepare for his attacks by knowing and standing firm on God’s truth. “Be sober-minded; be watchful. Your adversary the devil prowls around like a roaring lion, seeking someone to devour. Resist him, firm in your faith, knowing that the same kinds of suffering are being experienced by your brothers and sisters throughout the world,” 1 Peter 5:8-9. The Good News of the gospel is that Jesus delivered a death blow to our enemy and while he still tries to create havoc in our lives, sowing lies that can defeat and cause us to stumble, he no longer has authority over our lives. Those who have been purchased by His blood can confidently say, “The eternal God is your refuge and underneath are His everlasting arms. He will drive out your enemies before you, saying, ‘Destroy them!‘” Deuteronomy 33:27. 5. We have limited vision and understanding. For now we see in a mirror dimly, but then face to face. Now I know in part, then I shall know fully, even as I am fully known, 1 Corinthians 13:12. We can’t see as far ahead as God does, making us prone to actions based on limited sight and understanding, and allowing our emotions to carry more weight than God’s Word. When we see no evidence of God’s lovingkindness in our circumstances, or what good He could possibly bring out of our pain, we will be tempted to look for the closest exit door; whether that means quitting our job, leaving our marriage, going to a church that tells us what we want to hear, or rejecting God’s truth altogether. Opinions that exalt self rather than Christ. Temptations that subtly lure and entice us to sin when we push aside God’s truth and do what is right in our own eyes. The power we have, of course, is the gospel. We need to preach it to ourselves throughout our day, bringing each thought under the lordship of Christ. We are in a battle for the mind. Wrong thinking and self-exalting thoughts need to be demolished so they don’t sneak in and take up residence in our hearts. This means we must take every single thought captive, identify its source, test it against God’s Word. Any error that is exposed must be replaced by the truth of who God is, what He has done, and all that He has promised for those who walk in accord with His Word. Martyn Lloyd Jones has good counsel for those who are listening to themselves rather than listening to truth: “We must talk to ourselves instead of allowing ourselves to talk to us! You must say to your soul: ‘Why are thou cast down-what business do you have to be disquieted?’ You must exhort yourself, and say to yourself, ‘Hope in God’ instead of muttering in this depressed, unhappy way. And then you must go on to remind yourself of God. Who God is, and what God is, and what God has done, and what God has pledged Himself to do. Psalm 19 describes the many benefits God’s Word brings to us. It revives our soul, makes us wise, brings us joy, brings understanding to our hearts, are truths that will endure forever. Let’s talk to ourselves with God’s Word that is wise, pure, right, and brings life. For our joy and His everlasting glory.